You can trust Dr. Ravaei to perform safe cosmetic foot surgery for many common conditions, including Morton’s Neuroma treatment in Los Angeles, Beverly Hills, Huntington Beach, and neighboring southern California. Morton's neuroma is a painful condition which is most frequently the result of inflammation of the band of fibrous connective tissue leading along the sole of the foot, from the heel to the ball. The neurologic symptoms of this disorder were first described by English chiropodist, Durlacher, in 1845. Ironically this condition is named after T. G. Morton of Philadelphia who believed it occurred about the fourth digit due to irritation. Histologicaly there is strong support that this condition is due to an entrapment of the nerve. This condition occurs more often in women than men with age ranging from 18-60 years. However, it is most commonly diagnosed between the fourth and sixth decades. The patient is likely to be overweight. In milder cases the patient may describe a sensation of walking on a wrinkle in the stockings or a lump in the shoe. It is most common in the area between one's third and fourth toes. The growth of thickened nerve tissue, neuronal, is part of your body's response to the irritation or injury. Having neuroma may have the uncomfortable feeling of standing on a hot pebble or having a hot poker thrust between the toes. 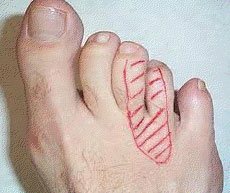 This condition is most common between the third and fourth toe. Dr. Ravaei has recognized that many of his patients with this condition feel a sharp, burning pain in the ball of the foot; the pain is most excruciating early in the morning and when the patient is wearing any shoe gear. Some may feel stinging, burning, and numbness in their toes. Conditions that are similar to the pain associated with Neuromas are stress fracture of the metatarsals, inflammation of the tendons in the bottom of the toes, arthritis of the joints or nerve compression further up on the foot. X-ray will not show the neuroma, however, it is required to rule out other diseases. Few of the tests that help in the diagnosis of neuroma could include MRI, EMG or nerve conduction study. None of these tests will individually diagnose this condition but they all help in the diagnosis. If he cannot feel the neuroma and if the patient's symptoms are not common, one area that may be examined is the ankle. Neuroma may occur in reaction to irritation, injury or pressure. Common treatments for Morton's neuroma include changing footwear, using arch supports or foot insert, over- the-counter nonsteroidal anti-inflammatory medications such as aspirin and ibuprofen, stretching, and physical therapy. Often home remedies will help for this condition. Rubbing an ice pack along the neuroma may help ease and reduce the pain. However, occasionally these treatments may not be sufficient, therefore corticosteroid injections or surgery may be necessary. There are many treatment methods that Dr. Ravaei utilizes to alleviate this condition. These could start with change in shoe gear, use of pads, use of strapping and use of orthotics. Should these fail, Dr. Ravaei might use an injection to alleviate the problem. These injections could either be steroids to reduce the inflammation or an alcohol to get rid of the pain. If these methods do not help in reduction of pain, Dr. Ravaei might advise surgery. The procedure involves removing part of the painful nerve. The patient needs to take few days off from work on speed the healing.